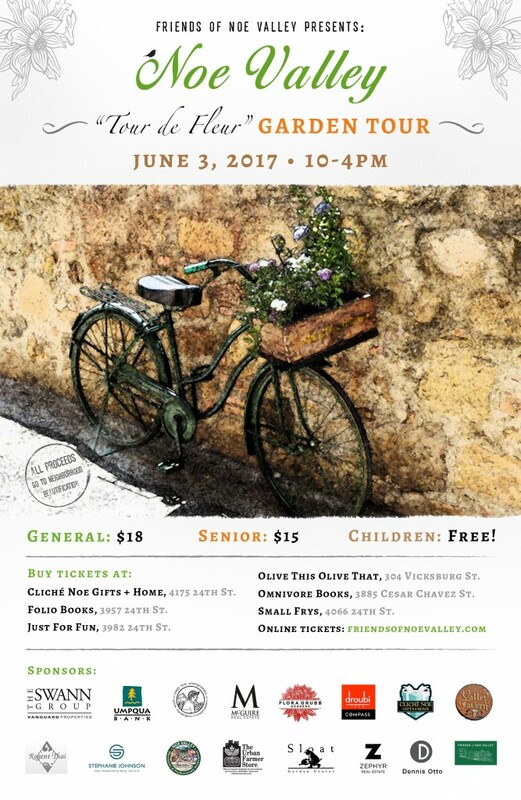 Tour de Fleur is the theme for the 2017 Noe Valley Garden Tour. After much needed winter rains, the 9 gardens on the 2017 Garden Tour are bursting with greenery. Trees, plants, shrubs and flowers are thriving with vibrant colors and lush foliage. You will be amazed at what a bit of water has done for gardens this year. Come be inspired! The tour will be held on Saturday, June 3rd from 10am to 4pm and nine gardens will be on view. Ticket prices remain the same at $18 for adults and $15 for seniors 62+. Children under 12 are free. Tickets are being sold on 24th Street at Cliché Noe Gifts+Home, Just for Fun and Folio Books, Olive This, Olive That on Vicksburg Street and Omnivore Books on 27th at Church. Tickets will be sold at the Farmer’s Market in the Town Square on Saturdays May 20th, May 27th and on the day of the tour June 3rd. You may also purchase tickets on line right here. Gardens this year include the 30th Street Senior Center where you will find one of Noe Valley’s hidden gems. This spacious garden is bursting with color and multiple surprises such as redwoods, olives, and fruit trees, vegetable beds, bee hives and a large entertaining patio. Three rooftop gardens are featured this year – a beautiful Mediterranean rooftop garden, a backyard with a modern contemporary rooftop garden and a well engineered and designed garden where obstacles were overcome to create a perfect rooftop for entertaining, bbq-ing or just relaxing. A fabulous pet friendly garden showcases a well appointed garden perfect for humans and their furry friends. Pets have room to run while their humans enjoy a lovely green oasis. Spectacular views over Noe Valley can be seen at a well established, beautifully landscaped garden filled with giant maples, and multiple entertaining areas. In a Malaysian style garden you will step into a green retreat created from rescued palms where calmness and relaxation dominate. You are sure to be enchanted in one lovely garden space where you will find a sunny front yard oasis and a shady backyard retreat. Come and be inspired by camellias, bromeliads, roses, ferns, wisteria, and numerous sculptural elements. Returning this year is Suzanne Bontempo, of Our Water Our World, who will share her expertise in a talk about How to Grow a Beneficial Garden for Pollinators. You can hear Suzanne at the 30th Street Senior Center at 11am and 12:30pm. Come learn and please bring your questions! Raffle tickets will be sold for a garden make over in conjunction with the Garden Tour. Once again Stephanie Johnson of Pacific Union Realty has donated a $300 gift certificate to Sloat Garden Center and four hours of labor in your garden as a grand prize. Two additional prizes are $50 gift certificates to Flora Grubb. Raffle tickets can be purchased at the same locations as the Garden Tour tickets and at the Saturday Farmer’s Market. If you would like to volunteer as a Garden Greeter, please email lindalockyer3@gmail.com. Shifts are two hours and Garden Greeters will receive a free ticket to the tour and a volunteer party on Wednesday, May 31st. The proceeds from the garden tour will be returned to the community through a donation to a beautification project in the neighborhood. The Friends of Noe Valley would like to acknowledge and thank the following individuals and businesses for their sponsorship and continued support for this wonderful Noe Valley event. We could not do it without their generosity!